More 3 stars chefs here. Other French chefs here. 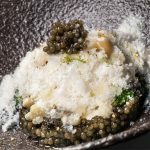 First of all, this is the story of René and Marie-Louise Meilleur, an ambitious couple who built up La Bouitte from scratch and turned it into one of the most sought-after gourmet restaurants in the Alps… and France – one of only 26 restaurants to be awarded 3 stars in the Michelin Guide. Right by the Menuires and Val Thorens resorts, at the heart of the Alps, the epic story of a gourmet restaurant with a unique character! They served typical Savoie fare – generous and unfussy. 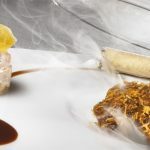 After the “culinary epiphany” of a dinner at Paul Bocuse, followed by the arrival of a resort in Saint-Martin-de-Belleville in 1984, René Meilleur began to develop a more sophisticated and creative cuisine. 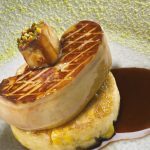 Indeed, La Bouitte in the hamlet of Saint-Marcel in Saint-Martin-de-Belleville, right by the Les Menuires resort, became known as a gourmet destination not to be missed at the heart of the 3 Valleys. As a former biathlete in the Junior French team, he drew inspiration from the values of sport: determination, endurance, and an appetite for challenge. Little by little, he led the team towards the ultimate prize. Then, father and son, thick as thieves, concoct delicious meals together. In 2000, the elder sister Sophie joined La Bouitte and helped design and furnish sixteen luxury rooms and suites. Over the years, Sophie, Maxime and their respective spouses, Florent and Delphine, built the chalet of their dreams, working the wood with their own hands and using only the most noble traditional materials of Savoie. In 2003, la Bouitte was awarded its first Michelin star, “René’s star”, in 2008 its second star, “Maxime’s star” and in 2015 the third, “René and Maxime’s star” as Marie-Louise proudly explains. At the same time, as the restaurant was developing, the hotel was being transformed into a haven of comfort and luxury at the heart of the 3 Valleys. The Bela Vya Spa, with its focus on natural treatments, opened in 2005. 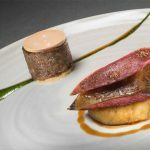 The “Meilleur” touch for the first restaurant in Savoie to be awarded 3 stars by the Michelin Guide. First of all, René and Maxime make an impressive double act: they’ve been working together for 20 years and will celebrate La Bouitte’s 40th anniversary at the end of 2016. 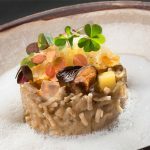 Later, this self-taught father and son team has developed a creative and subtle cuisine, genuine and irreverent, which draws inspiration from the culinary traditions of Savoie while paying homage to them. Most of all, this is a cuisine in harmony with its environment: the Meilleur kitchen has forged its identity using local produce rich in meaning and steeped in history. Indeed, La Bouitte successfully combines authentic surroundings with an avant-garde exploration of cooking and wine. Most of all, its harmony and poetry owe much to René. On top, Maxime’s training as a top level athlete left him with a determination to always do better and an economy of movement. Moreover, Maxime’s perfectionism is always in conversation with René’s experience. There is a natural harmony. Indeed, this self-taught duo heads a team devoted to finding the perfect balance between tradition and modernity, authenticity and elegance, precision and risk. Of course, they deliver an unmistakeably audacious take on the best local produce. Their delicate, fresh cuisine evokes the complexity and generosity of the natural world. Yet, fall in love with their compositions, each full of delicate details. Playing with texture, this is a cuisine which gradually reveals subtle associations of flavours. More 3 stars chefs here.